Education. It’s something taken for granted in many developed countries, but when it comes to the doors of opportunity, a good education is the master key. This master key not only opens doors for individuals, but entire cultures to develop in their perspectives, practices, wisdom, and overall happiness. In the jungles of Belize, education is a great need, not because of their desire to be educated, but in the capability of teachers to teach and students to learn in an environment that facilitates a curriculum that allows their children to compete in today’s ever-changing job market. Imagine the difficulty of creating a competitive learning environment on an empty stomach, walking or riding a bicycle several miles to get to school, and with very little access to computers or the Internet in the technology age. I’m very thankful that God is giving me the opportunity to serve with Grace Klein Community, updating a Christian high school’s computer lab, and serving at Zion Elementary School. I’m also pleased to let you know two ways you can show God’s love to the children of Belize! Last night at the Grace Klein Community Prayer Night, I learned that the plane tickets for this trip have officially been booked for August 14-17. 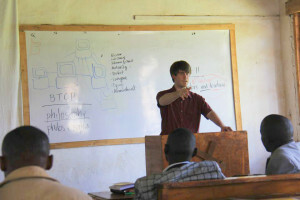 • We will upgrade a computer lab at King’s College, a Christian high school in a remote jungle village. This school needs an up-to-date, reliable computer lab for their students so that they can compete in the job market and to keep the school’s government accreditation. The environmental conditions in the area are extreme and as a result, computer equipment tends to wear out quickly. We are taking equipment that is designed to better withstand the conditions and will be easier to maintain. • We will visit Zion Park Elementary, a small elementary school close to King’s College. All of the children and teachers walk or bike to school, and most of them go several miles. The principal is Mrs. Ruth Williams, a sweet, dedicated Christ-follower who sacrifices much to love and educate these children. We will check on their computer equipment and internet service, take school supplies for the students, and help with whatever else they need to get ready for the start of the school year. When stomachs are filled, hearts and minds are opened. $110 feeds a child at the school for a month, there are 80 kids at the school. Would you like to provide food for these kids and facilitate a brighter future for them? If we each sacrifice eating out for lunch or dinner just once a month for a year, we would have enough to provide the $110 for one child. Education opens countless doors for developing countries, and having a full stomach goes a long way to helping a child focus on their learning. Contributions can be made to Grace Klein Community, the non-profit organization that is organizing this trip. They seek to build a sense of community with the Biblical idea that if we all share, we can all have enough. You can mail a check to 1678 Montgomery Hwy #104, Birmingham, AL 35216, with Missions – Belize in the memo line. Or, you can go to gracekleincommunity.com and click Donate, where you will be able to contribute through PayPal. All funds received will be used for missions. Please pray for our safety, and that God’s wisdom and love for these people shines through us as we provide for these people’s needs. Pray that God gives us strength in our preparations, and provides for our financial needs. I only need to raise $600 to make this trip, so if you would like to be a part of this ministry through giving, CLICK HERE to be directed to our Grace Klein Community donate page. Please be sure to indicate “Belize” in the memo line when donating.